One thing that fascinates me about Chile are the license plates on vehicles. Even though Chile is divided into regions for local government purposes, the license plates don’t hint at which region a person is from. 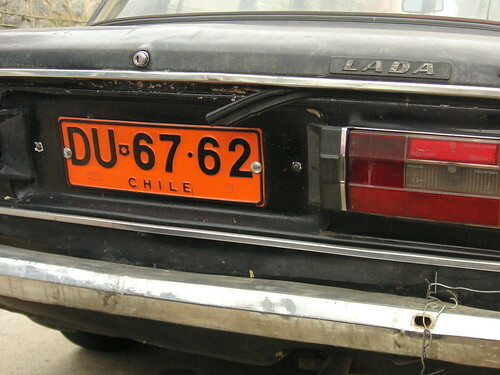 The typical Chilean vehicle will have a white license plate with black letters and numbers. Under the letter and number combination, is the name “Chile”. If you look closely, however, you’ll notice that not every vehicle has these generic white license plates. The white plates are for private vehicles. Radio taxis sport an orange license plate. You’ll notice them because they contrast nicely with the black paint on most taxis. Blue license plates are diplomatic plates. Red license plates are from the Zona Franca, a tax-free zone that you’ll find at the extreme ends of the country, Punta Arenas in the South, and Iquique in the North. Because these cars are purchased at a discount (no tax), they can only be outside of the zone for a limited time. There are hefty penalties and regulations around the sale and use of these vehicles purchased in the zona franca. Look around you as you drive across Chile or sit in traffic on a busy street. How many different license plates can you find? A Lada – fine cars of the Soviet Union. I thought Nicaragua was the only country that still used those for taxis. @David – The Ladas are becoming less common but you’ll still find them around!